Kiss me, I’m an Irish Wolfhound! This St. Patrick’s Day we’re feeling very lucky to be a part of this incredible community! We’re very excited to announce a new fundraiser! DAWG has teamed up with Painted Cabernet in Santa Barbara for a night of paint, wine, and of course, dogs! For every person who attends, the Painted Cabernet will donate $5 to DAWG. You’ll have the opportunity to make the lovely dog painting pictured to the right, plus the cost of attending the event includes a free glass of wine! For more information about the event, and to buy tickets, go to our web page for the event! We want to send all of our love to DIANI for donating a portion of their sales to DAWG and hosting an adoption event for us! From their Valentine’s weekend sale, DIANI donated $4,028 to DAWG! So incredible! Also, the dogs from the adoption event held at the DIANI store have gotten a lot of interest, and one was even adopted! We would also like to thank the generosity of everyone from George’s Pet Shop for also hosting an adoption event for us. Not to mention RiseUp Fitness for hosting a fundraiser that brought in $800! They’re so incredible that they are offering a free pass to DAWG Supporters! Anyone that mentions the DAWG newsletter will get a 3-Day Pass to RiseUp Fitness anytime throughout March, go check it out! A local news channel, KEYT also covered the adoption event at George’s Pet shop for our three-legged, adoptable senior girl, Tally! Go check out their great coverage of the event, here! We also wanted to highlight some very cute little donors who came to DAWG in February to help the doggies! 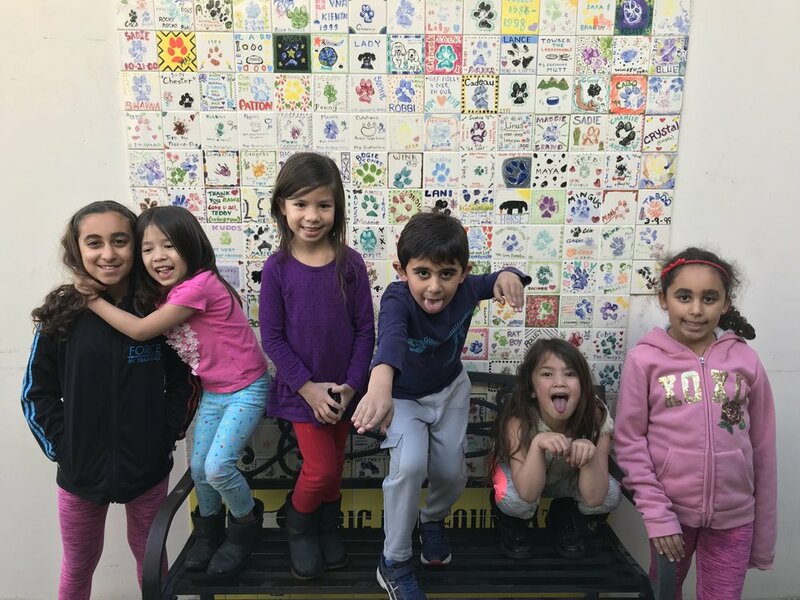 These kids, pictured to the right, made a lemonade stand and raised $125.50 for DAWG! They are a group of truly incredible kids! Thanks to everyone who bought a Valentine for our dogs! We sold a total of 70 Valentine’s! Every one sold helps us care for each and every DAWG dog! The DAWG dog that had the most Valentine’s was Bronson, with a total of 6 Valentine’s! He is such a lover, and is available for adoption! As a non-profit, we operate exclusively off the generosity of our community. We couldn’t provide the love and care we do for our dogs without the support of the amazing people and businesses in our community like everyone who bought a Valentine, the wonderful local kids who made the Lemonade stand, RiseUp Fitness, DIANI Boutiques, and George’s Pet Shop! If you’d like to make a donation to DAWG to help us keep the tails wagging, you can make a monetary donation here, or if you’d like to donate food or other items we need please check out our shelter wish list. If you’re a local business who would like to host a fundraiser or adoption event please reach out to us at info@sbdawg.org! Keep an eye on our calendar to be aware of upcoming events, and make sure to follow us on social media to see new dogs, training tips, and pictures of cute pups! We also keep the website updated with any new dogs that come in. Remember, every time we adopt out a dog we bring in a new one so we’re always at capacity! We have a number of new dogs to meet right now and we’d like to warmly welcome you to stop by the shelter anytime to say hi to your new best friend, or check them out on our website! If you’re not interested in adoption at the moment, we’re always looking for foster homes for our senior and medical dogs. The more dogs we can put into foster, the more lives we can save! We’re incredibly blessed to be a part of such a beautiful, supportive community and we want to thank every supporter, donor, volunteer, and advocate for helping us support our mission to reduce the rate of euthanasia in Santa Barbara County. We would like to welcome our new Kennel Attendants Amy, Angelica, and Monica to the DAWG Pack, and the pack wishes Mike and Hugo so much luck on all of their new adventures! Local kids who made a lemonade stand and raised $125.50 for DAWG! The painting we will be making at the DAWG Painted Cabernet Event on Wednesday, March 27th at 6pm. Get your tickets, here! Sweet Rosie helping out in the DAWG office. Rosie is available for adoption at DAWG! If you’re interested in learning more about this little lady, call the DAWG office at (805) 681-0561 or, email adopt@sdbdawg.org! Volunteer and supporter of DAWG, Jeffrey with DAWG dog Lily at the DIANI Adoption event. Lily is available for adoption at DAWG. If you’re interested in learning more about this little flower, call the DAWG office at (805) 681-0561 or, email adopt@sdbdawg.org! Our volunteers work tirelessly to ensure the health and happiness of the DAWG dogs. That’s especially true for our volunteer of the month for March, Tino Garcia! Tino is a long time DAWG volunteer who works with our more difficult dogs in training. He has a very special relationship with long term DAWG resident, Panda. He comes in almost every day and works with our red dogs on training and socializing. He is an enormous help to staff and is an invaluable asset to DAWG as he is making a huge impact on the dogs he works with. Thank you, Tino, for all of your years of dedication and service to DAWG and all of the dogs you have worked with and helped in your time here! We’d also like to recognize all of the wonderful work DAWG Volunteer Shelley Greenbaum has done for DAWG, but especially for sweet senior, Tally. She set up the adoption event at George’s pet shop, called local newspapers and news media to cover the adoption event, and attended both events to advocate for Tally! Not to mention her generous donations to help Tally and other dogs with training and set them up to have the tools that they will need in their new homes! She is an incredible blessing to DAWG, and we would like to thank her for all of her years of service to animals in need! Kennel Attendant Jonah, with a new DAWG dog Scooter! Scooter is available for adoption and is currently in foster with Jonah. 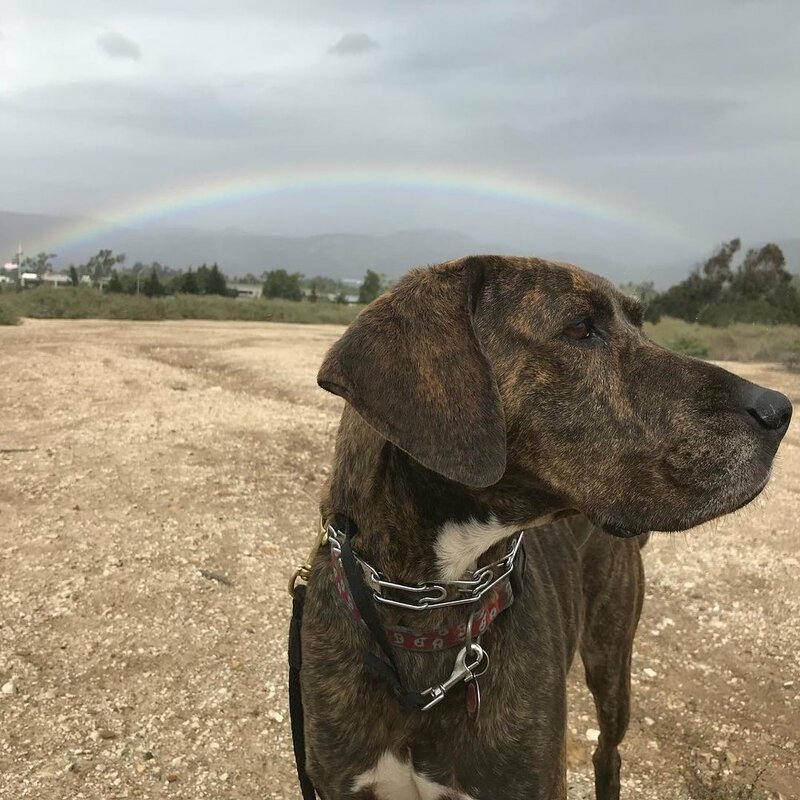 If you’re interested in learning more about this sweet boy, call the DAWG office at (805) 681-0561 or, email adopt@sdbdawg.org! Due to high demand, we will be adding additional spaces to each volunteer orientation! We will also be adding an additional orientation to each month and dog training class dates. Training classes are now available on Sundays at 10 am and 11 am. We will now offer an orientation on the 4th Saturday of the month at noon in addition to the 2nd Saturday of the month at 10 am! You can sign up for an orientation date here, and the training classes here! We’d also like to remind all our volunteers that we hold a pack walk every week on Wednesday’s at 10:00 am. The pack walks also function as intermediate volunteer training classes, if you’re new to the pack, and still in training! Please join us on Wednesdays for a fun and enriching experience for the dogs. In other volunteer news, with the help of our fantastic hosts, DIANI and George’s Pet shop we have been doing more adoption events to get the DAWGs out into the community! We’re looking for volunteers to come and be advocates for our dogs and help us transport them to these events! We’re also always looking for volunteers to help walk dogs, help in the office, help with grooming the pups, and give tours and answer questions about our dogs on tours for potential adopters. If you’re interested in any of these volunteer jobs please let the office know! Also, we’re always looking for volunteers to take pictures and videos of the dogs at the shelter and at events! If you’re interested in helping out with photography, please reach out to the office for more information. It can’t be said enough how grateful we are for our volunteers. The tireless, selfless work that they do in support of our mission to represent the population of all homeless dogs regardless of breed, age, gender, or disability goes above and beyond the call of duty! We cannot thank our volunteers enough for all that they do. If you’d like to join the team, we would love to have you! Our next orientation is at noon on Saturday, March 27th, 2019. You can sign up online here, or if you have any questions about volunteering with DAWG please call the office and we’re happy to answer any questions you may have. We hope to see you at the shelter soon! We always need help, walking dogs, cleaning kennels and anything in between! We have something for everyone. We hold a monthly open house on the second Saturday of every month! Sign up for the next orientation date online! Andi is a wonderful addition to our DAWG Team! She does a fantastic job managing the veterinary calendar and clinic and making sure the medical needs of our dogs are taken care of. Andi is super approachable and welcomes all staff questions, and is such a pleasure to be around. She's a new staff member, but we already don't know what we would do without her! Thank you Andi for all of your hard work and dedication to our mission! Tino is a long time DAWG volunteer who works with our more difficult dogs in training. He has a very special relationship with long term DAWG resident, Panda. He comes in almost every day and works with our red dogs on training and socializing. He is an enormous help to staff and is an invaluable asset to DAWG as he is making a huge impact on the dogs he works with. Thank you, Tino for all of your years of dedication and service to DAWG and all of the dogs you have worked with and helped in your time here! Tally is a 10-year-old lab/pit mix, and she is a giant sweetheart, you can tell the instant you look into her eyes. She has her Canine Good Citizenship Certificate and is a graduate of Therapy Dog Class through All for Animals. Her previous owner relinquished her due to a move across the country, and soon thereafter she had to have her back left leg amputated because of a bad tumor. Tally is recovered from surgery really nicely in a foster home, but she is now back at DAWG and is still looking for a family to call hers forever. Despite Tally only having 3 legs, it doesn't stop her from running and playing with the energy of a dog half her age. Tally loves the car, and she'll happily go anywhere with you. You sometimes forget she's out with you at restaurants and events because she is happy to simply lie down by your side. She is very well behaved and rarely barks. Her previous owner took her into work with him every day. She does have separation anxiety, but Tally is showing great progress. DAWG will continue to develop tools for her to increase her independence while searching for her new home. Her ideal new owner either works from home, can take Tally into work, or doesn't work and can spend most of their day with this loving lady. It’s best if she doesn't go into a home with small dogs, as her play can get a little rough, although she can definitely learn boundaries and has been living with a 13-lb dog-sibling in foster considerably well. Tally is also good with cats! She’s great with kids of all ages, all people, and is just looking for a loving home. If you think you can provide that for her, give the DAWG office a call at (805) 681-0561. We had yet another successful month of adoptions! So many happy tails! Below are some of the highlights for our adoptions in February. Every one of our staff members, volunteers, and foster families work so hard to find the best homes possible for all of our dogs. It’s a team effort, and we couldn’t do the work that we do without everyone working together! We’re so grateful for the supportive community around us, and the other local adoption agencies like the Humane society, K9 Pals, and the county shelter system. When we all come together for an animal in need magic happens! We also want to thank all of their staff and volunteers for all of the tireless work that they do for the animals in need in our community. The pictures in the slideshow above are in order of their adoption stories below. It is truly amazing what can be accomplished with teamwork! In Fall of last year Penelope, a tired old girl was found lying in front of an apartment complex in Santa Maria. She was found by a good Samaritan, brought to the Santa Maria County Animal shelter and was named Penelope. At first, Penelope was very shut down in the Santa Maria shelter, until she discovered they had treats! Then she really came out of her shell and charmed everyone she met. Unfortunately, being shy was not the only problem Penelope had. She had mammary masses, some of which had ulcers and a hernia so big that every vet that saw it was surprised by the size of it. Her scans showed not only a loop of intestine inside it but also her part of her uterus. Penelope would require surgery to remove the masses, repair the hernia and spay her. K-9 PALS of Santa Barbara came to the rescue by providing funds for not one, but two surgeries for this sweet girl! Please consider making a donation to this organization, to support all the amazing work that they do in the Santa Barbara community! Penelope went into foster to await surgery; and when the day of Penelope’s first surgery came, she was so brave. The surgery was to remove the masses she had on one side. The awesome team at Animal Care Hospital in Lompoc did an amazing job! Brave Penelope had staples going the length of her tummy, but she never stopped being loving. After the first incision healed you could barely see how long it had been. Great news, her mammary tumors were benign! More great news, DAWG found her a forever home! When Penelope had her first meet and greet with her new family, they fell in love with her as quickly as everyone else who met her. Her second surgery was scheduled for January and this would remove the masses from her other mammary chain, repair her enormous hernia and finally spay this 12-year lady! Another big incision for this poor, patient girl. She was a rockstar through the whole process and Animal Care Hospital did an unbelievable job on her complicated hernia repair. Penelope was medically cleared on February 6th. And went home with a new brother, a 12-year-old, one-eyed English Lab named Trent and her 6 new feline siblings. It was a smooth transition with just a few tears in her foster mom’s eyes. Penelope is doing wonderfully in her new home! This small dog, who weighed under 30lbs, brought the animal community together to make her life better than it had ever been. It takes a village to take care of them all and for pretty Penelope, the village made a huge difference together. Cheerio and his new dad in their road trip van. Cheerio is another dog that found his forever home this month! Cheerio is a sweet little Basset hound loaf that was transferred to DAWG from the Santa Maria shelter. Originally, he came into the county system as a stray after being abandoned by his family in the street. His previous family wasn’t done mistreating him, however, as they repeatedly tried to take him back and force him to live outside or in poor conditions despite having abandoned him already! They tried to get their friends and neighbors to adopt him on their behalf but never had any intention of treating him better than they did the first time. He is a hospice case with inoperable terminal cancer all over his body. The veterinarian determined that he doesn’t have much longer before he goes over the rainbow bridge. We knew we could help Cheerio and find him a great home to live out his remaining days in peace and happiness, where he will be loved dearly and treated like a family member as he deserves to be, unlike in his last home. Thanks to the incredible community of supporters and dog lovers alike who shared Cheerio’s story on social media, we found him a home in just a few days. He’s doing wonderfully with his new family, and is currently on a road trip with his new dad! He is enjoying his peaceful life of simple comforts and love and running on the beach. If you’re willing to open up your heart and home to a pup, we’re always looking for foster homes for senior, medical, and hospice dogs. If you’d like to give a home to a rescue in need please give the office a call at (805) 681-0561. Addie was a long time resident at DAWG. She came to DAWG originally from the county system after being picked up as a stray. She was at DAWG for 2 years waiting for someone who was willing to take on her extra challenges. She had some behavior work she needed to do before she could find her forever home and she wasn’t making as much progress as we would have liked here at the shelter. DAWG decided to hire a local trainer to foster her and work with her on the issues she was working on in an in-home boarding program. She started making progress so much faster! She was doing a great job and was eager to learn the things she needed to finally find a forever home! After a few weeks in the training program, she was ready for a new home to practice all she learned in! She found a wonderful foster home with a very loving new mom, who is really committed to her training and helping her progress and get better every day! She lived in her foster home only a few weeks before her new family decided they loved her too much to ever give her to someone else and they decided to adopt her. A wonderful foster failure! She is doing great now in her new home with a loving new mom, a cat, and a falcon! We couldn’t be more proud of her progress and we are very grateful to Eric Stokell of Follow The Leader K9 for working with her and helping her get to be the amazing dog we always knew she was, and for continuing to work with Addie and her new mom to make sure the adoption sticks and Addie continues to practice good habits! We’ve had a very busy month, getting into a new clinic groove and working on new approaches to scheduling, sedated procedures, parasites, and prevention! Our Clinic was very busy stepping up our diagnoses, treatment, and prevention of a number of zoonotic diseases. What is a zoonotic disease? It is a disease that can be transmitted from animals to people or, more specifically, a disease that normally exists in animals but that can infect humans. There are multitudes of zoonotic diseases. The World Health Organization (WHO) estimates that 61 percent of all human diseases are zoonotic in origin, while 75 percent of new diseases discovered in the last decade are zoonotic. Rabies, Lyme Disease, some gastrointestinal disease, and certain dermatological disease fall into this category. At the beginning of February, we were fortunate to bring in the first two of four Aussie Shepard mix puppies that were trapped and rescued by Leslie Bloomer of Aussie Rescue. We saw Zeus and Leia first. What was going to be overnight in ISO, turned into the rescue and medical rehabilitation of four beautiful pups, Zeus, Leia, Sunny, and Daisy! Zeus and Leia were captured first and came to the clinic with profound malnutrition and what appeared to be mange. Due to the fact that the puppies were virtually feral, with diarrhea and no known medical care, we were all concerned about the welfare of our DAWG dogs that are older or have compromised immune systems. Fortunately, skin scrapings and fecals at an outside clinic revealed that they were both positive for sarcoptic mange. While sarcoptic mange is more responsive to treatment, it is visually the most intimidating to see on a dog. Sarcoptic mange is a highly contagious skin disease found in dogs, caused by the Sarcoptes scabiei mite. These mites burrow through the skin, causing intense itching and irritation. The scratching that results from mange is what causes the majority of the animal's hair to fall out. Poor Zeus was nearly hairless. Untreated, a dog can literally lose all its hair. Sarcoptic mange is highly contagious to other dogs and humans. Although sarcoptic mites are not able to complete their life cycle on humans, they will cause severe itching until they die in two to five days. On that note, we handled them with caution and held off on vaccinations, and the spay and neuter until they were showing signs of improving health. In the following week, their littermates were trapped and brought into DAWG following the same health check procedures. Sunny and Daisy followed similar treatment protocols, and all were treated for tapeworms. Four weeks later, as of March 7th, all have been cleared for adoption following their respective spays and neuters. Cones were all removed and the four littermates were reunited to play together for the first time since coming to DAWG so ill, and malnourished. Personally, for me, this month has been a valuable lesson in parasite lifecycle, treatment, remedy, and prevention. It has been incredibly rewarding in the clinic to see the pups’ health and body scores improve so radically. And to see Daisy, now known as “Maisy”, and Leia be joined with their new homes and Zeus and Sunny finding theirs as well! Thanks especially to the Kennel Attendants for really taking such care to respect the parasite protocols and treatments. We also have had only two cases of Giardia, which is remarkable given the heavy rains, long-standing puddles and the sneaky and pernicious nature of Giardia intestinalis (aka Giardia duodenalis, Giardia lamblia)! Unfortunately, Bronson was returned to DAWG with a case of Giardia and the big & sweet Lily arrived with a healthy case of Whipworms. As if burrowing mites and terrible itches aren’t bad enough!? I am so proud of and thankful to our Kennel Manager, Kylie, and the entire Kennel Attendant staff for taking such incredible care and showing great mindfulness to prevent the spread of both of these highly contagious conditions. I appreciate the photos and proactive nature you all have shown! On the healing front, Scooter has gained 11.5 lbs since he arrived at DAWG! With our lab work and the dietary and environmental changes, he is showing huge signs of increasing health. His IM specialist consult and ultrasound with Dr. Claudia Bowman revealed his pancreas and kidneys are in healthy condition, and it is likely a case of Inflammatory Bowel Disease, while cannot be cured, can be managed with diet and supplements. We are following her directive care here a DAWG! Scooter is loving his new foster home with Kennel Attendant Jonah, his girlfriend Maddie and their Doberman, Bella! Ron came into the Clinic for a quick check of his ears and eyes. He must really love visiting the clinic because, on two subsequent days, he surprised us with getting his beloved Kong stuck on his lower mandible. Fortunately, it was rubber and due to the malleable nature of a well-worn Kong, we were able to stabilize it and him (Kylie and Jonah) and I was able to get my right index finger behind and under, and remove it. Otherwise, we have been busy clearing long-time DAWG dogs for their new adoptive homes! Many dentals and subsequent groomings have revealed some show stoppers. See the before and after of Yorkie, Milo in the slideshow above. And Big Bruce left for his Furever home! Many of you are aware that Bruce was our massive blue nose Pitty with a case referred to as “FCE,” Fibrocartilaginous Embolism; a condition that causes the acute death of part of the spinal cord, caused by the embolus of fibrocartilaginousmaterial. I cried happy tears watching Big Bruce lumber home with his new family. Even his tail had healed! Also, a big shout out to Jennifer Ding, a local student who is interested in becoming a veterinarian and volunteers in our Vet clinic to learn about her chosen field! She is an ever-faithful clinic intern. Above, Jennifer is assisting Dr. Zaboly with the early stage of sedation, commonly referred to as "masking down" before intubation and under anesthesia. It is a great joy to serve as an advocate and guardian to these incredible canines. Thank you to everyone for your spirit of support and cooperation. DAWG is run entirely by donations and grants generously given to us by our wonderful community. All the work and expenses that it takes to run the veterinary clinic would not be possible without our amazing donors. If you’d like to contribute to the DAWG veterinary clinic to help us care for our dog's medical needs you can make a donation here. Springtime is great for many reasons, especially if you have a beloved pet dog. You can spend more time outdoors, being active together, and your dog will love the opportunity to romp and play out of the house. However, there are some particular challenges that come with the warm weather season, especially when it comes to keeping your dog healthy. One of those challenges is ensuring that your dog stays safe if you are an avid gardener since the chemicals and tools required for gardening can be potentially harmful to your dog. Read about how you can keep your dog safe, healthy, and happy during the gardening season--so you have a garden that flourishes and a dog that stays well all spring and summer long. If your dog has ingested something in your garden and you're worried it's dangerous, call your vet right away, or rush your dog to the nearest animal hospital. Do you want to make sure your dog doesn't eat anything poisonous? And do you want to keep your beautiful plants safe from your dog? Then consider fencing off your garden so your dog cannot get in it. The fence does not have to be heavy duty or elaborate; chicken wire will keep most dogs out of the plants and flowers. When your dog spends time outside in the garden, it's possible he might pick up parasites like ticks or fleas. Check for ticks when your dog comes inside, and remove them when you find them. If you suspect your dog has fleas, visit the vet to verify. You can prevent any flea infestations by giving your dog a flea pill on a monthly basis. Encourage your dog to stay on your garden's walking path by using a material that is dog-friendly to make the path. This means that you should avoid any material that will get too hot on a dog's paws since he won't be wearing shoes as you will! One way to keep your dog safe from your gardening tools is to make sure that you put your tools away when you're done using them. This means that shovels, trowels, hoes, and more should be stored out of reach when you're done working in the garden. By putting tools away, you avoid the chances that a dog accidentally chews on or injures himself on them. The warm weather months are great for gardening, but they can also be challenging if you have a pet dog. Take some steps to keep your dog safe during gardening season, and you can ensure that your garden thrives and that your family gets to enjoy a beautiful (or delicious!) garden all spring long. A common question people who come to DAWG have for us is: why do you have so many Pitbulls? The answer is that there’s a world of misconceptions about pits that lead to a lot of confusion. Unfortunately, the result of that is many pit bulls end up homeless and living in shelters, or are senselessly euthanized because of that misinformation. We’d like to set the record straight on these loving, loyal companions. The most frequent stereotype that everyone has heard attributed to pitties is that they are aggressive fighting dogs. We’ve heard every tall tale about Pitties that there is- that they bite and have locking jaws, that they will go crazy and turn on you for no reason, that they were made for fighting and are incapable of anything else- we could go on. Factually, all of that is simply false and is a complete misrepresentation of their long history as a breed. There’s actually no clear definition for what a pit bull is to pin that bad reputation too. Recent research utilizing canine DNA has demonstrated that dogs who are commonly identified as pit bulls based on their appearance are quite often a mix of multiple breeds. The genetic line for Pitbulls has become so diluted, it’s almost as if no two pitties are the same these days. According to the ASPCA, dog breeds are characterized by certain physical and behavioral traits. Each breed was originally developed to perform a specific job, whether that job was hunting rabbits, retrieving downed birds, herding livestock or sitting on people’s laps. A pure-bred dog has both the physical attributes necessary to perform its job and the behavioral tendencies needed to learn it. It’s not surprising that individuals of a specific breed tend to look and behave somewhat similarly. Pointers are more likely than Poodles to point, and sheepdogs are more likely than lapdogs to herd. However, while a dog’s genetics may predispose them to perform certain behaviors, tremendous behavioral variation exists among individuals of the same breed or breed type, especially when mixed with other breeds. It’s also important to keep in mind that some dog breeds are now bred for entirely different jobs than those for which they were originally developed. For example, certain strains of Golden Retrievers are now being bred as service dogs, which is a big leap from their original job of retrieving downed birds and aiding hunters. Today’s pit bull is a distant descendant of the original English bull-baiting dog—a close relative of the English bulldog, it is a dog that was bred to bait and bite bulls and other large animals for the entertainment of spectators. When baiting large animals was outlawed in the 1800s, these larger, slower bull-baiting dogs were crossed with smaller, faster terriers to produce a more agile and athletic dog for working on farms and protecting livestock and families. These dogs were very domestic and known for their gentleness, affection, and loyalty which made them extremely popular family pets. Pitbulls didn’t receive their undeserved reputation until criminals and animal abusers used them to fight each other for entertainment based on their bull-baiting lineage. But, even those pit bulls who were bred by dog fighters and taught to fight other animals were not prone to aggressiveness toward people. Dogs used only for fighting needed to be routinely handled by people; therefore aggression toward people was not tolerated. Any dog that behaved aggressively toward a person was killed to avoid passing on such an undesirable trait. Unfortunately, dog fighting does still take place today. Dogs used in dog fighting will have a long road to recovery before they can heal, and some may never be good with other dogs again due to the abuse they sustained. However, that doesn’t mean that every pit bull in a shelter was used for dogfighting. Actually, as dog fighting isn’t prevalent in Santa Barbara County, there are none with that known background currently at DAWG. According to the ASPCA, research on dogs who live in homes shows that dog aggressive dogs are no more likely to direct aggression toward people than dogs that aren’t aggressive to other dogs, no matter the breed. This is a common misconception, caused in large part by people attempting to break up dog fights incorrectly by sticking their hands into it and attempting to pull the fighting dogs apart. This is the wrong thing to do, as in nearly all instances the person will be bit accidentally by one or both of the dogs. Instead try throwing water, throwing objects and making sudden loud noises. These can break apart two fighting dogs, without putting a person at risk. Dogs of all breeds have to be socialized with other dogs and people, and not socializing dogs properly results in behavior issues down the line. If your dog is undersocialized, there is still hope! Dogs can be socialized later in life too, it’s never too late. Later in life, it is more about breaking your dog's bad habits and giving him good behaviors to replace them with. The best way to accomplish this is with the help of a qualified trainer. DAWG is happy to recommend numerous dog trainers, just call the office for a recommendation. Socialization, however, has nothing to do with a dogs genetics and has to be taught to dogs. Some people accuse pitties of being bad on a genetic level. They say that pitties are born aggressive and will turn on you at any time. This misnomer is factually incorrect and has no evidence or basis in science. Sweet Fawn who was at DAWG for nearly a year on her freedom ride with her new family. According to National Geographic, of the 78.2 million dogs in the United States, 3.91 million of them are pit bulls. 40 percent of dogs in animal shelters are classified as bully breeds and only 20 percent as pit bulls. Bully breeds include numerous breeds of dogs including Boston Terriers, Mastiffs, Bulldogs, and Pitties. 86.8 Percent of pitties have passed their temperament tests according to the American Temperament Test Society. That is the fourth highest passing grade of the 122 breeds that were tested. They rank higher than Collies, Golden Retrievers, and Beagles! Shockingly, 22 percent of shelters euthanize pit bulls regardless of their disposition and 60 percent of all dogs in shelters are euthanized each year due to the bad reputations that they get, kennel space issues, being looked over for adoption and for having medical or behavioral issues. Aside from their undeserved reputation, you find pits in shelters because while a lot of people love the breed, they were scared by inaccurate information and they are unwilling to rescue or adopt a pit bull because of the myth that they are only good if you train them yourself from the time they’re a puppy. Dogs, including pits, come to rescues in all sorts of conditions with every background imaginable. Dogs who have experienced trauma or mistreatment have grown to be loving trusting companions and working with them from the time that they are puppies doesn’t affect the results you will get. In fact, irresponsible breeders have the potential to cause lifelong behavior problems with dogs through breeding the dogs to relatives, or the abuse or neglect of puppies before they get to a pet store. If you train your dog properly and have a little patience, you will see the results you want to see whether or not it’s a puppy no matter the background of the dog. Lastly, another reason you find so many pitties in shelters is because of breed specific legislation. Many housing agencies and communities outlaw power breeds or Pitbulls due to their reputation because of the common misconceptions addressed above. In Santa Barbara, there is less than 1% available housing. When a pit bull or other power breed owner needs to move, they find it nearly impossible to find a residence that will allow them to keep their dog no matter their disposition. A power breed dog is a class of dog that was bred initially with the purpose of working or hunting. It’s a dog made to be strong and do a job. These dogs are high energy, strong breeds. Examples of power breeds are Huskies, Shepards, cattle dogs, and Pitties. Power breeds are usually the targets of breed discrimination, due to their higher energy levels. Without proper exercise and stimulation dogs can become destructive to the home. Power breed dogs are intelligent, and high energy and it can become a complication when they aren’t getting an appropriate amount of exercise and stimulation. They are also targeted because of people that think that if a breed was originally intended to do a specific job, that is all they’re capable of doing, and therefore wouldn’t make good family pets. According to Pitbullinfo.org, a nonprofit research group dedicated to dog bite prevention and the responsible ownership of dogs of all breeds, there are zero scientific, peer-reviewed studies that conclude that any one breed is "inherently more dangerous" than any other breed. However, multiple peer-reviewed studies have concluded that Breed Specific Legislation is ineffective, that the risk rate for pit bull-type dogs is fully in-line with the risk rates for other strong breeds, and that preventable factors related to irresponsible ownership are the primary cause for the majority of dog bite-related incidents. They go on to say, peer-reviewed studies have concluded that the preventable factors related to irresponsible ownership are the primary cause for the majority of dog bite-related fatalities and that breed is not a factor. Breed Specific Legislation does nothing to address the relevant factors that are directly and scientifically linked to serious dog bite-related incidents such as a dog's history of negative behavior, previous bite-related incidents, and factors related to irresponsible ownership. It’s a truly unfortunate consequence for families with fantastic dogs that they love, and are forced to give them up when they move because their new home doesn’t allow breeds like Pitbulls, Huskies, German Shepards and more. This leads to more pitties and other power breeds taking up spaces in shelters when they should be with the families that love them. A town/city-sponsored educational program for dog owners that covers the basics of responsible dog ownership including health requirements (rabies shots, spay/neuter, regular veterinary visits), training dogs, handling dogs, and keeping children safe around dogs (applies to all dog owners - not just parents). The most impactful thing you can do to help Pitbulls is to kindly clear up misconceptions when you come across them. Educating the community about them, and dispelling rumors and myths that create so much fear can actually help prevent issues! In Santa Barbara County there is a three strike policy for dogs. If a dog has three incidents where the county was called due to a bite or aggression incident to people or other dogs then they will have a dangerous dog hearing to determine if that dog should be euthanized. However, in Santa Barbara County for a report to be filed on a dog that may result in that dog being quarantined for aggression and creating a strike on their record, the way the law is written is that all a dog has to do is make someone feel threatened. They don’t have to come in contact with a person or other dog at all, just if a person is scared or feels like the dog is aggressing on them that is enough to have a dog put in quarantine whether or not that was the case. With so many people scared of Pitbulls, this happens to them regularly without cause and has serious consequences for the dog and owner. Without doing anything wrong they can be seized by the county and put into quarantine because of someone’s misplaced fear. Dispelling those rumors can prevent things like that from occurring and keep innocent dogs safely with their families! Another thing you can do is make sure to always follow leash law. Knowing if your dog isn’t good with other dogs, is important too. If they aren’t, don’t take them to dog beaches or on hiking trails that may have off leash or loose dogs. If a pitbull gets into a dog fight with another dog, no matter the circumstances or who aggressed on who, the pitbull takes the blame a majority of the time. Incidents with pit bulls are taken a lot more seriously than with other dogs because of their reputation and they typically have much harsher punishments for incidents like that than another breed would. Pits are scrutinized in a way other dogs are not and they aren’t given second chances very often. That means it is important to keep the safety of pitties in mind when doing things that could create an incident, like having your dog off leash in a non-designated zone or being careless or reckless with their safety by not following rules intended to keep all dogs and people safe. Another step you can take is to become an advocate to a pitbull! Coming to DAWG and adopting, fostering, or volunteering with pitties can help them get out into the world and start a conversation about their breed in a positive way with people that may not have known the history of the breed, or the statistics. If after reading about pitties you’re still not sure, come to DAWG and meet some of the complete goobers with huge Pittie smiles we have currently available for adoption, they will surely change your mind! Most of these dogs were bred to be working or hunting dogs; the Irish Wolfhound was bred to hunt wolves, and later was used a “wardog.” Several of the Irish dog breeds are very rare, including the Irish Red and White Setter, and one of the rarest breeds in the world, the Irish Glen of Imaal Terrier. The Irish Wolfhound is a very old breed, with records of them being brought to Ireland as early as 7000 B.C. Irish dogs are featured heavily in Welsh and Celtic mythology too. Celtic hounds were thought to protect lost souls and helped guide them to the underworld. Along with their connection to the underworld, they also symbolized hunting and healing. In Welsh mythology, a pack of supernatural hounds called the Cŵn Annwn was led by Gwyn ap Nudd, the ruler of the underworld, called Annwn. All Irish dogs are described as active dogs, who have quirky natures and great personalities. If you see one of these dogs on St. Patrick’s Day, it might just be a stroke of good luck! And if you have one of these dogs, may the “luck of the Irish” be with you. Does Your Dog Have An Irish Name?